In order to understand the extent to which the Standards of Care for Dementia are having an impact on the lives of people in care homes, we undertook a study in 145 care homes for older people from June 2016 to March 2017. The findings of our study are published in My Life, my care home. The examples and illustrations of effective practice contained in this report could inspire staff and managers to try out something in their care home. This resource can be used by services as part of their self-evaluation and as part of quality monitoring, managers could use the areas for improvement as a measure for how their own care home is doing. We expect all care homes to regularly use observation as part of their ongoing quality assurance. This is an important way to see if learning and development is making a positive impact in practice and to ensure staff are confident in supporting residents to experience. The report covers each of the dementia standards and sets out what we expect to see, what we found and areas for improvement. We expect that people living in a care home receive a timely and accurate diagnosis and are provided with the information they need about their condition, treatments and support. This means that the person receiving the diagnosis and their carers are given the right information at the right time to live well and be involved in decisions that are important to them now and in the future. Where a person lives should not make any difference to access to a diagnosis and support. Where a person receives a diagnosis of dementia while they are using a care service, we expect care services to play a role in supporting them and their families to understand how that diagnosis will inform their care. Receiving a diagnosis of dementia can be a challenging experience for both the person and their family. Recent work with post-diagnostic support as outlined in the five pillars model from Alzheimer Scotland has indicated that the right support at the right time can make a significant difference for all affected. We recognise that many people receiving their diagnosis while in a care home setting may be at a more advanced stage of their dementia experience and the support may need to be tailored to meet these different needs. We expect to see closer relationships between community support and care homes to address this unmet need. We also expect to see closer working between community post-diagnostic support and care homes. There are many care homes that would be able to provide excellent post-diagnostic support to residents and families, however issues of capacity and joint working need to be carefully considered by integration authorities. We would like to see clear and easy access for people in care homes to be assessed for a possible dementia diagnosis and to receive post-diagnostic support where appropriate. This ensures that people living in care homes receive the same access to care and treatment as those living in the community. The 5 Pillars of Post Diagnostic Support - The purpose of the Scottish Government's Post-Diagnostic Support guarantee is to provide the security, for a minimum of one year, of a named person who has the flexibility to work alongside the person, their partner and family and ensure that over that 12 month period each person is given help and support to work through the five pillars. We expect that people with dementia are treated with dignity and respect, with their individual needs, preferences and aspirations being met. We expect that they are listened to, feel included and are treated fairly. They should receive information and the necessary support to continue to participate in decisions which affect them now and in the future. Care homes should prepare a written plan after consultation with the person and where appropriate their representative. This should set out how the person’s health and wellbeing should be met. The personal plan must be a living document which supports and directs the care in a very person centred and practical way. These personal plans should be reviewed with the resident at least every six months or more frequently if their needs change. They should include the resident’s wishes and choices, personal preferences, interests, communication needs and details about any necessary equipment or adaptations as well as when relatives should be contacted and who should be contacted if the resident wants to raise a complaint or concern. We expect to see that people living with dementia and their carers have access to independent advocacy should they want it. We also expect care and treatment that people living in a care home receive is provided following best practice and takes account of relevant legislation. All care homes must record the past, present and future aspirations of people living in the care home and use this information to direct care and support for people. People living in care homes should have access to independent advocacy and staff should know how to access services in their area. Section 47 certificates must detail the treatment they cover in line with best practice and legislation. We would like to see improved partnership working between GPs and care homes to develop treatment plans to support people living with dementia. Beyond life histories - Beyond life histories is a free eBook written by Helen Sanderson and Gill Bailey. This easy-to-read resource would be helpful to anyone involved in dementia support. It illustrates nine practical ways to deliver personalisation with people with dementia. We expect to see that people with dementia receive good quality, timely and integrated assessment and treatment and that they experience a person-centred approach to support and care. We looked at three areas under this standard; use of medication for people experiencing stress and distress, oral health and continence. We expect that they receive the right treatment at the right time, including a range of non-drug based treatments if they experience stress and distress. Older people living in care homes are at higher risk of oral health problems and related conditions because of high levels of dependency and dementia. Caring for Smiles is Scotland’s national oral health promotion, training and support programme, which aims to improve the oral health of older people, particularly those living in care homes. Promoting continence is a vital component of health and wellbeing and for a person living with dementia can underpin a positive sense of self. It is important that all older people in care homes have their oral health assessed when they first come into a care home and then regular on-going assessments are carried out. This helps establish a baseline of their oral health on admission to the home. Care homes should ensure that oral health assessments form part of the welcoming process when a new resident moves in. Arrangements must be in place to ensure that all people living in a care home have access to dental care. Care homes should support them to keep their own dentist if preferred and practicable. Personal plans should describe clearly the support that people need to maintain good oral health which includes teeth, dentures and gum care. Care homes need to ensure that people who require assistance with oral health receive this regularly as recommended by their dental health team. Consideration should be given to seeking additional support, as well as a dentist when needed, to support oral care. This could include working with the person’s family, GP or linking with community mental health team/community psychiatric nursing teams. Staff need to be trained and skilled to support people to maintain good oral health and to be able to identify potential issues. Care homes should consider having oral health champions within each home to help keep staff up to date with the latest best practice guidance and to monitor oral health care provision in the home. There has been an improvement in the use of non-pharmacological interventions rather than medication as the first line response to stress and distress since Remember I’m Still Me in 2009. However there remain areas for development which will have a positive impact on both the people being supported and the staff. We expect all care homes to engage with NHS Education for Scotland and Scottish Social Services Council to develop staff in understanding stress and distress in people living with dementia. We expect care homes to have appropriate links and relationships with community mental health teams and/or care home liaison teams to put into practice formulation-led interventions. Care homes need to further develop their role in monitoring medication and the condition it is prescribed for including knowledge of the side effects of medications prescribed. Staff need to be knowledgeable and confident in their skills to ensure that the medication that is prescribed is enhancing quality of life and doing what it is intended to do. We expect care homes to have in place good collaborative working with GPs and pharmacists. Strategies and methods to support people experiencing stress and distress must be clearly developed, noted in the personal plan and known to all staff. Where “as required” (prn) medication is prescribed for stress and distress, we expect to see this detailed in personal plans, with clear conditions for its use and expected outcomes, with a record of whether these outcomes were actually met. Nationally and locally, further work is needed to raise the profile around the overall health and wellbeing benefits that is linked to actively promoting continence for all older people who present with a bowel and/or bladder care needs. Promoting continence is a vital component of health and wellbeing and for a person living with dementia it can underpin a positive sense of self. Promoting continence should not be seen as a task, but as an opportunity to engage with a person in a meaningful way. For example, as a person is accompanied to the toilet the member of staff can be assessing mobility, have a chat which can give information about mood and wellbeing, as well as assisting the person to go to the toilet. This can impact on quality of life as well as contributing to physical wellbeing. Although we recognise that incontinence may affect a person with dementia at the latter stages of their experience, it should not stop staff from seeing the potential in a person to maintain or possibly regain continence. We expect people living in care homes to have a continence assessment. We want to see staff who are confident in using a range of strategies that promote continence. This includes exploring alternatives to the use of products. We expect care home staff to engage with the resources that are available to them to help them actively promote, maintain and/or improve continence care outcomes for people living in care homes. We encourage care homes to use the Care Inspectorate’s continence resources to support them on their improvement journey. Promoting Continence for People with Dementia and Other Long Term Conditions - This resource can be used by people living with continence issues, their families and carers as well as health and social care staff across a wide range of care settings. Standard: "I have the right to be as independent as possible and included in my community." We expect to see residents being given opportunities to remain as independent as possible and, where possible, regain skills that they may have lost but with support of 24-hour residential care can once more be achieved. Relationships are vital for the wellbeing of people with dementia and we expect care homes to support families and friends to remain connected to their loved ones. Moving into a care home should not mean the loss of community connections. We expect care homes to be part of their community. We expect care homes to use the information they have about people to offer meaningful activities for all individuals. We expect care homes to support residents to keep connected with their community. We expect people to have increased opportunities for activities at weekends and evenings. We expect all staff to understand the importance of meaningful activities for people and to take an active role in this. We expect care homes to support people to maintain relationships with family and friends. We expect all care homes to identify the potential in every individual and support the remaining strengths of the individual to promote wellbeing. We expect care homes to have secure gardens that can be accessed independently by people including those with physical disabilities. Access to gardens needs to be available for all and not only those living on the ground floor. We expect in determining appropriate staffing levels that care homes take into account people having access to outdoor/and the community and the support people need to maintain relationships. We expect to see care homes quality assuring their environments to meet the needs of people living with dementia. We expect environments to promote wellbeing and not to be a barrier to independence. Is Your Care Home Dementia Friendly? - To support clinical and care staff, managers and estates colleagues, The King's Fund has produced a range of resources to enable hospitals, care homes, primary care premises and specialist housing providers to become more dementia friendly. We expect to see that care staff have the knowledge and skills they need in relation to their role in supporting people with dementia and that they receive appropriate learning and development, levels of supervision, and opportunities to reflect on their practice. We expect family members and friends to be recognised and valued as partners in care and to be supported in their role. This should include invitations to contribute to staff development. We expect care homes that support people living with dementia to have a skilled and knowledgeable workforce who provide care and support to meet each individual’s unique needs. We also expect staff to know the overall aim or vision of the care home and to appreciate how their learning and development fits in with this aim to give residents the best quality of life as possible. We expect staff to know and understand the aims of the care home and how their role supports meeting these aims. We expect care homes to have staff who understand the importance of person-centred care through learning and development, and are able to put this into practice by moving away from task-driven care to care and support that meets the needs of each individual resident. We expect care homes to align staff roles and responsibilities to the Promoting Excellence Framework and to develop staff so that they have the skills and knowledge outlined at each level of the framework. Care homes should ensure that all staff receive learning and development opportunities in dementia practice appropriate to their role, and are confident and competent in applying that learning in order to improve experiences and outcomes for people living there. We expect care homes to provide supervision and development opportunities to staff in order to support staff wellbeing and resilience. We expect care homes to make use of Scottish Social Services Council and NHS Education for Scotland resources in dementia practice and supervision. NHS Education Scotland has updated learning resources within the Promoting Excellence Framework detailing the knowledge and skills all health and social services staff should aspire to achieve in relation to the role they play in supporting people with a diagnosis of dementia, and their families, and carers. You can find the learning resources on the Dementia Managed Knowledge Network. We expect to see residents living well and being supported to plan for a good end of life. We expect to see care homes supporting the physical and emotional needs of the person and their families. We want to see staff who are skilled and confident in their roles, and who know when they need to bring in additional support from the wider health and social care team. We expect care homes to work in partnership with other agencies and professionals to ensure people’s wishes are known and respected, and we expect local partnership to work across health and social care boundaries to promote good anticipatory care planning. For this standard we chose to look at the use and understanding of anticipatory care planning, which helps people make choices about their future care and Do Not Attempt Cardiopulmonary Resuscitation (DNACPR). We also looked at the support that care homes receive from external agencies. The areas for improvement are focused on the areas that we looked at during the inspection focus on dementia. We expect care homes to have knowledgeable staff who have the confidence and skills to start conversations about what is important to people at end of life and see this as part of their role along with other professionals. We expect care homes to ensure staff understand ACP and DNACPR, how to use these in everyday practice and how to involve families in these conversations. We encourage care homes to use resources such as those published by Healthcare Improvement Scotland (HIS). We expect care homes to be able to access additional support from health and social care partnerships as required. People living in care homes have the same rights of access to health and social care support as people living in the community. It is important that care homes engage with the Scottish Government’s Strategic Framework for Action on Palliative and End of Life Care to both ensure that residents receive the best possible care at end of life and that staff are given learning and development to do this. This framework sets out the approach and shared vision for people in Scotland where by 2021 everyone who needs palliative care will have access to it. Supporting Derek - This resource pack published by the Joseph Rowntree Foundation in partnership with the University of Edinburgh, is aimed at staff supporting people with learning difficulties who develop dementia. A series of factsheets which provide useful information on looking after people with dementia have been published by the Dementia Services Development. The factsheets provide practical advice on ensuring individuals with dementia are neither too hot or cold to prevent ailments such as dehydration, confusion, lethargy, constipation and urine infections. of particular interest will be a factsheet which highlights the importance of communicating with people with dementia and a factsheet on the importance of lighting. The National Dementia Strategy 2013 - 2016 sets out the work that the Scottish Government and its partners in NHS Scotland, local government and the voluntary and private sectors are planning to improve support, care and treatment for people with dementia, their families and carers. It is the second three-year strategy for improving standards in dementia care in Scotland, building on the Scottish Government's first strategy, published in 2010, which focused on improving the quality of dementia services through more timely diagnosis and on better care and treatment, particularly in hospital settings. In 2011, NHS Education for Scotland (NES) and the Scottish Social Services Council (SSSC) developed Promoting Excellence: A framework for health and social services staff working with people with dementia, their families and carers. 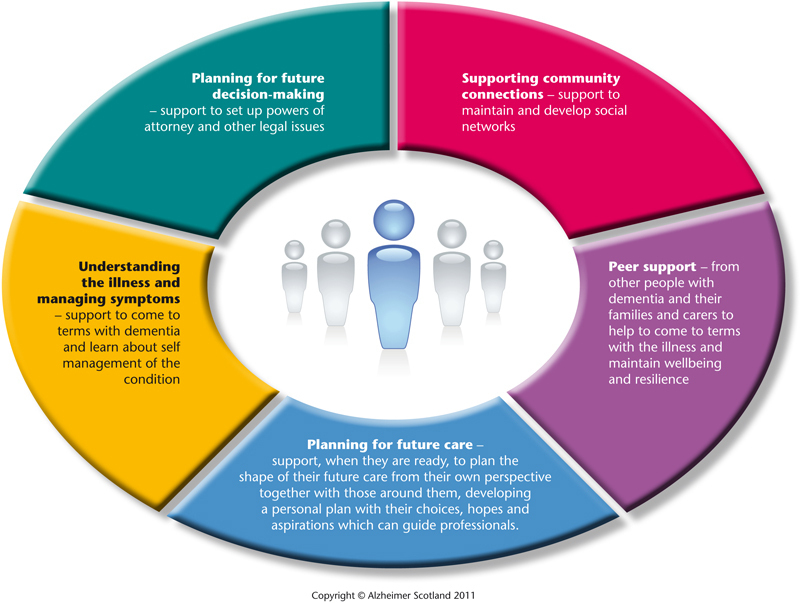 Designed to support delivery of the aspirations and actions outlined in the Scottish Government's first National Dementia Strategy, the framework details the knowledge and skills that health and social services staff should aspire to achieve in relation to the role they play in supporting people with a diagnosis of dementia, and their families and carers. The Standards of Care for Dementia in Scotland were published in 2011. These relate to everyone with a diagnosis of dementia in Scotland, regardless of where they live, their age, the supports they receive or the severity of their illness. This includes younger people, people with a learning disability and people with rare types of dementia. They apply to people living in their own homes, care homes or hospitals, especially general hospitals. The Charter of Rights for People with Dementia and their Carers in Scotland - People with dementia and their carers (family members and friends) have the same human rights as every other citizen. However, it is widely recognised that, in addition to the impact of the illness, they face cultural, social and economic barriers to fulfilling these. This Charter aims to empower people with dementia, those who support them and the community as a whole, to ensure their rights are recognised and respected. Remember I’m Still Me - Care Commission and Mental Welfare Commission joint report on the quality of care for people with dementia living in care homes in Scotland. Alzheimer Scotland - Campaigns for the rights of people with dementia and their families and provides support services. The 8 Pillars Model of Community Support - In its National Dementia Strategy the Scottish Government commits to "test and evaluate a range of approaches to providing better integrated care and support on the basis of the 8 Pillars model, centred on a Dementia Practice Coordinator role". Developed by Alzheimer Scotland, the 8 Pillars Model of Community Support is designed to provide a coordinated approach to supporting people to remain at home for as long as possible. Essential 5: Personalised Outcome Planning - Personal outcome approaches and personalised planning mean that support needs to be centred around what matters most to the person and their carers. This involves engagement with the individual carer as equal partners about what is important to them in their lives, good quality recording of this and then using this information for decision making and quality improvement. Advanced Dementia Model - Alzheimer Scotland’s Advanced Dementia Practice Model sets out an integrated and comprehensive approach to providing care and support for people with advanced dementia and at end of life with dementia. It combines the skill and understanding of the existing 8 Pillars Team and introduces an Advanced Dementia Specialist Team to provide optimum care. Scottish Dementia Working Group - The Scottish Dementia Working Group (SDWG) is a national campaigning and awareness-raising Group whose members all have a diagnosis of dementia. They are the independent voice of people with dementia within Alzheimer Scotland. National Dementia Carers Action Network - Alzheimer Scotland’s National Dementia Carers Action Network (NDCAN) are a national campaigning and awareness raising group whose members all have experience of caring for someone with dementia. Life Changes Trust - The Life Changes Trust committed to working with people living with dementia and those who care for them, investing our resources so that individuals are more able to face the challenges before them, and can exercise more choice and control in their own lives. Dementia Friendly Communities - The Life Changes Trust has invested in a wide range of Dementia Friendly Communities (DFCs) across Scotland.